The Fruit Guard is a treasure in Pikmin 2, in the US version only. It is located in the eighth sublevel of the Cavern of Chaos. This item is in a dead-end and may be surrounded by Dwarf Red Bulborbs or Gatling Groinks. Attack the former from above, and assault the latter from behind with purples. The Fruit Guard is an aluminum can of Tree Top brand apple juice. Artwork of the Fruit Guard. The location of the Fruit Guard. The Fruit Guard being analyzed. 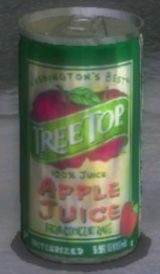 A Tree Top-brand can of apple juice in the real world. This page was last edited on January 12, 2019, at 23:28.